For the first time in 15 years, we do not have plans to go to Honduras this year. We have always wanted Hondurans to take ownership of the work we have been doing together and I believe this is beginning to happen. As you know we raised funds to build a CFI (Center of Integral Formation), on the national university campus in Comayagua. The ground was leveled, the foundation was laid and the walls were set in place. The work was stopped when the entire university system became involved two years ago. During the interim, Oscar Meza, the director of the university worked hard to get approval to continue the building, resulting in a formal signing of an agreement in May, 2011. So the partial building has been there for the past two years looking like a Mayan ruin. Since we did not have the funds to continue, I challenged the university to sell the books that we had printed and to use the proceeds to continue the construction. Although they did not sell as many books as we desired, they did sell some. They have sold about 640 books and have $3770 in the account. That leaves them short only $3142 needed to put the roof on the building. We don’t know where the rest of the funding will come from but would like to help them along if we can. Oscar has not asked us for money but this is not a large sum of money and it would greatly encourage him and the university in their work, if we were able to help them to finish this stage of the project. We have a legal agreement with the university system to build and manage this building and it took a lot of work to make that happen. It is hoped to be a center where values and principles can be taught along with many other things that students need. 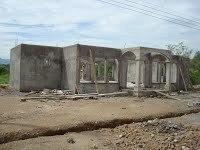 We feel committed to build the building a little at a time as funds are available. Getting the roof on would be a big step forward. 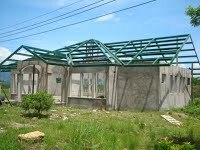 Oscar and others decided to go ahead and put up the framing for the roof with the money they had with hopes that they could raise the additional funds to finish the roof. They started the work on May 8 and finished on May 19 as shown in the photos. Director Meza may have other ideas as to where the additional funds will come from but please help us with donations of any amount if you are able. I’m sure any help you can provide will encourage director Meza who has been a consistent friend in the university system. Thank you so much! We'll be sure to let you know how it's going.